A Gulf coast oil platform needed help in reducing gas temperature flowing into its pipeline, the result of higher than expected gas temperatures and increased flow on the platform. Contributing factors included high ambient conditions, as well as increased flow rate from a third well being brought on line. The customer had been using cooling water from an adjacent canal, which had also increased in temperature as a result of summer conditions. Gas temperature was already at 119 °F (48.5 °C) and could not exceed 120 °F (48.9 °C). The customer was having to scale back flow to avoid exceeding requirements, and needed an alternative solution to help improve production. The offshore platform's size, high-pressure gas flow, and significant power limitations offered only a tiny footprint for an equipment package that would also need to be explosion-proof. This was the first known instance in which a customer approached Aggreko with such an issue. Aggreko’s technical team responded with an approach and equipment that reduced the discharge temperature by 10%, helping the customer to a significant boost in production. Within seven days, Aggreko provided a closed-loop chilled water system to run through the customer’s exchanger and drop the temperature of the gas. The system included (4) 200 ton explosion­ proof chillers, (2) explosion proof pumps, (1) 300 amp I-line panel with breakers, (1) 3000 amp circuit breaker, and all chiller hose, fittings and cable needed for connections. Aggreko tested all equipment prior to shipping, and later tested all on-site assemblies while also providing round-the-clock staffing to operate the equipment. Finally, Aggreko trained the customer’s personnel on the coordination of operations to ensure project success. 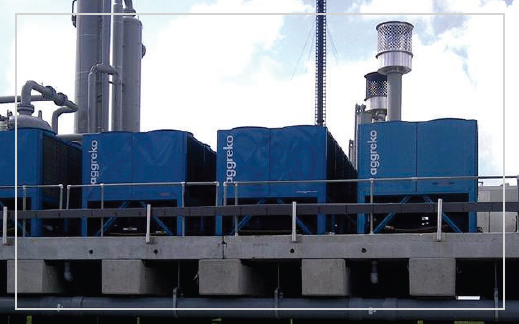 Aggreko’s closed-loop chiller system allowed the customer to increase flow rates by more than 50% and maintain a gas discharge temperature of 108 °F (42.2 °C). Aggreko was able to meet the customer within two hours of the phone call, and mobilize fleet immediately upon sizing the project. This was an extremely time-sensitive matter for the owner and speed of response was critical. Using the custom designed Aggreko process, the customer was able to significantly increase production while making a significant financial impact. The job was performed safely and without incident.